It looks like one of those meringue puffs you find in a plastic tub at the grocery store — and that’s what you’d naturally expect it to taste like. But this is Alinea. It surprises you with a crunchy, spicy shell filled with a rich, salty-sweet interior. If you didn’t know what was in it, you’d have to think about it for awhile to place the flavors. A surprisingly good combination of flavors! In all of these recipes, Achatz and Company use pink salt and sugar to “cure” the duck liver before using it. No explanation is given in this cookbook, it is assumed you know how to cook foie gras au torchon. 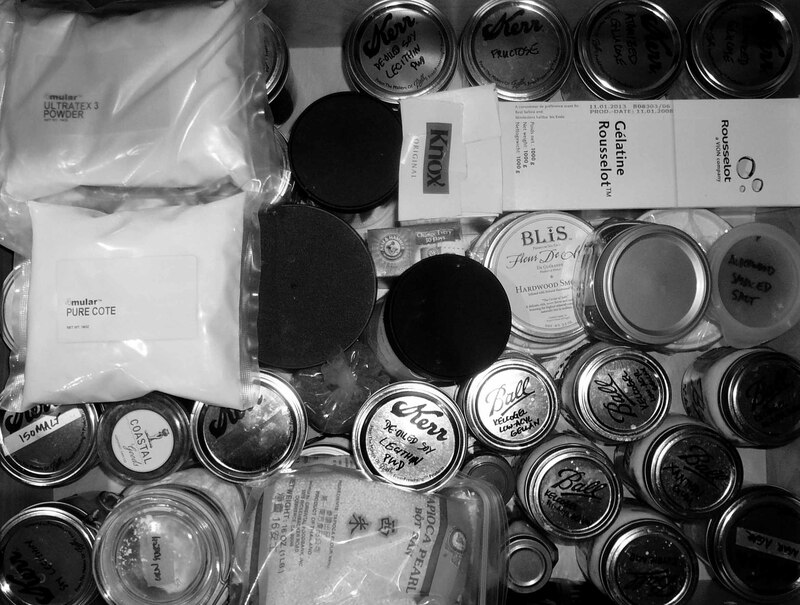 Notably, Thomas Keller goes into detail about the curing process in his books. Don’t simply use salt that’s pink in color like Himalayan pink salt, Hawaiian Alaea salt, or Murray River salt. The required pink salt (also known as curing salt and Prague powder #1) is an entirely different thing: salt mixed with sodium nitrite or sodium nitrate. The nitrates act as a preservative, boost the color of the meat (somewhat like big pot blanching does for green veggies), and inhibit the growth of bacteria. And it’s generally called “pink salt” because color is added to differentiate it from regular table salt. I rinsed off the foie, trimming off any silverskin, veins or greeblies. My overly curious kitchen help loved the few scraps I had. I used Morton’s TenderQuick curing salt, adjusting the salt and sugar asked for in the recipe. Mixed the dry ingredients in a stainless bowl, then sprinkled on the foie gras. I cut off the portion of the lobe I’d need for this recipe, chopped it up into one-inch cubes, rolled the cubes into a cylinder shape in a vacuum bag, and sealed with my FoodSaver vacuum sealer. I let this “marinate” overnight in the fridge. I vacuum packed the remainder of the curing foie for SQUAB, Watermelon, Licorice, Foie Gras. I used Mexican cinnamon, or canela (kah NAY lah). The recipe says to toast your cinnamon in an oven for about ten minutes. But I decided to toast it in a skillet. So I broke it up in small pieces and threw it in a hot skillet, toasting until the cinnamon released its aromatic oils. Combined the water, sugar and a pinch of salt in a medium saucepan and brought it to a boil. Then poured over the cinnamon and cayenne pepper in a stainless bowl. Let steep overnight. The next morning, I strained it into a plastic container and reserved in the fridge. It arrived in a shipment with some other dubious white powders from Florida, which I immediately stashed in my Alinea drawer. I put some of the reserved cinnamon tea and a tiny bit of Methylcellulose F50 in the stainless bowl of my KitchenAid stand mixer. Then blended in with my Cuisinart SmartStick immersion blender to incorporate the powder, and reduce the chances of chunks of powders/solids in my puffs. Hate it when that happens. …until it formed stiff peaks — just like with a meringue. Then transferred the “meringue” to a pastry bag. Easiest way to do this is to put the bag in a tall, narrow container, folding the edges over the top. Then you have both hands free to spatula the foam in. Piped the “meringue” onto a nonstick baking pad I’d cut to fit into my dehydrator. This recipe made enough meringue for dozens of puffs! So many, in fact, I decided to see if I could dry some out in an oven at a very low temp. I dehydrated the puffs at 150ºF until they were crispy. It took quite awhile longer than the four hours recommended in the recipe. I think it was at least 6-8 hours. But they came out perfectly, beautifully shaped, in a creamy-white color with faint specs from the cayenne. Then I hollowed them out from the bottom with a little pumpkin carving tool. I stored them in an airtight plastic container. They stayed crunchy for a couple of days. If you leave them out, they’ll get soggy, absorbing the moisture from the air. But I found that you can dehydrate them again. Mixed together the sugar pectin and citric acid. I heated the apple cider and glucose in a medium saucepan, then added mixed dry ingredients, and brought to a boil. I added some more sugar, boiling it down for a really long time until it reached 225ºF. Poured into a prepared glass pan and refrigerated. What a pretty Fringe Amber color!!! Unfortunately it didn’t set up hard enough the first time, so I reheated the gummy stuff and added some more yellow pectin. Then refrigerated overnight. I removed the cured foie cylinder from the vacuum bag and rolled it up in cheesecloth, tightly forming a “sausage” shape. This is to contain the fats while the foie is poached in boiling water. Cooking foie gras in this manner is called au torchon (oh tore SHAWN), “torchon” meaning “towel” in French. The foie can be wrapped up in a cloth, towel, or cheesecloth to form it while it cooks. Then tied the ends tightly with kitchen string. Then plunged the roll into an icebath to cool. After it had chilled, I removed it from the icebath and dried it off. I was ready to push it through my drum sieve into a stainless bowl. This separates the veins and unwanted nasty bits from the pure foie fat. Then, using a spatula, I transferred the foie “paste” into a pastry bag for piping, and reserved to the fridge. I assembled the components in my prep area. Assembly this time was a much easier job than on some other complicated Alinea recipes. I removed the foie from the fridge to warm and soften. Had the cinnamon puffs in a container, and they were still crunchy. And had the apple candy goo ready to go! Using a pastry bag, I filled the cinnamon puff shells with foie gras. Then plugged each bottom end with some of the apple candy. If you object to foie gras, you could easily omit it, and use solely the apple candy. They were both quite delicious! You can use anything to plate. At Alinea, they use a linen-covered paddle. Kinda like a very large frosting spatula, or a very narrow pizza paddle. I used a glass slab, ’cause it looked cool. Yields: Lots of puffs, enough to make several dozen! With a large tray of apple candy left over.